When the Islamic State of Iraq and the Levant—also known as ISIL—swept into Iraq, capturing large swaths of territory, including Iraq’s second largest city Mosul, in 2014, Azhar had no choice but to flee. Azhar had not seen her family in three years. When the Islamic State of Iraq and the Levant—also known as ISIL—swept into Iraq, capturing large swaths of territory, including Iraq’s second largest city Mosul, in 2014, Azhar had no choice but to flee. She, along with her four daughters and husband, packed whatever they could carry and set off to the closest displacement camp. Her father and mother stayed behind. Azhar eventually settled in Baharka, a camp in the Kurdish region of Iraq. With ISIL firmly in control of Mosul, her parents were trapped. The only way they could communicate was by phone, but her father was often too emotional to speak. “I couldn’t talk to him over the phone because he cried all the time when we spoke,” she explained. She listened helplessly from afar as her mother explained that they could no longer get their heart medications and, eventually, that her father had a stroke and was using a wheelchair. Clean water and food were limited at best. While living in Baharka, Azhar was recruited in 2014 to work as a community health worker (CHW) with International Medical Corps as part of a wider health program in the camp. International Medical Corps trained Azhar and her fellow CHWs on how to be aware of—and deal with—common health issues, like lice, scabies, and diarrhea, so that they could then pass that information onto other families living in the camp. The CHW program as well as the camp health clinic was funded by Canada’s Department of Foreign Affairs, Trade and Development, DFATD. She was soon promoted to the CHW Team Leader in Baharka. Then, in 2016, when the battle to retake Mosul and surrounding villages began, she joined the Emergency Response Team (ERT) as a CHW Field Assistant. 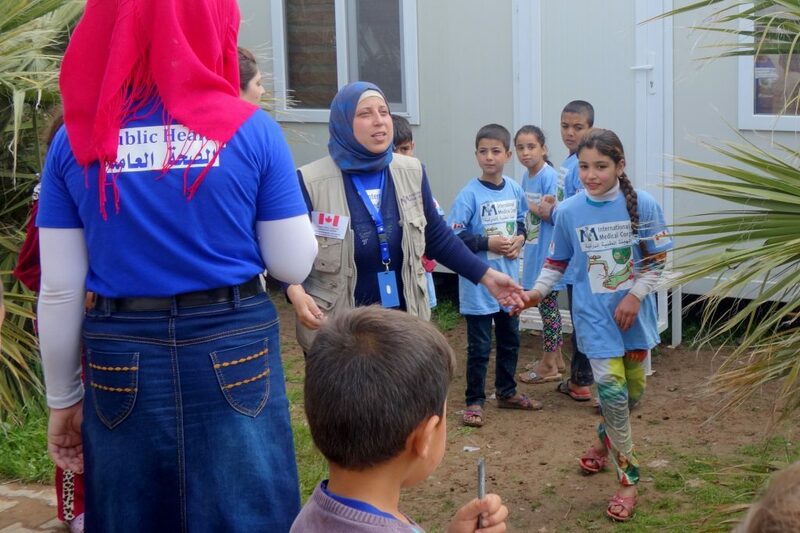 In this role, she traveled to work in camps housing families just displaced from Mosul to help carry out public health campaigns and connect people to International Medical Corps’ health care facilities. When Iraqi Security Forces reached her parents’ neighborhood in Mosul, ISIL tried to force them to act as human shields. Her parents managed to escape with 500 other families and eventually made it to Jada’a camp. As part of the ERT, Azhar was sent to Jada’a, where she was reunited with her parents for the first time in three years. It was a miracle for me to see them,” she said. Today, she continues to work in Jada’a, spreading health messages and helping keep families forced from their homes safe and healthy. She also gets to see her parents after three years of uncertainty and separation.